Has it rained every day we’ve been in Mexico? No, there was one dry day. I wanted to get this post out yesterday but the power was out at the hotel due to the storm, eventually the power came back but it took some time for the internet to start working. Where to start……..
Last Wednesday I got a call from Fabian from the KTM dealer, there are no fuel filters for a KTM in all of Mexico and it might take weeks to get one from Europe. The “good” news was that they removed the fuel pump and cleaned the filters so, according to them, I should be able to make it home. Deby and I doubled up on her trusty BMW and rode the 30 miles to pick up the bike. 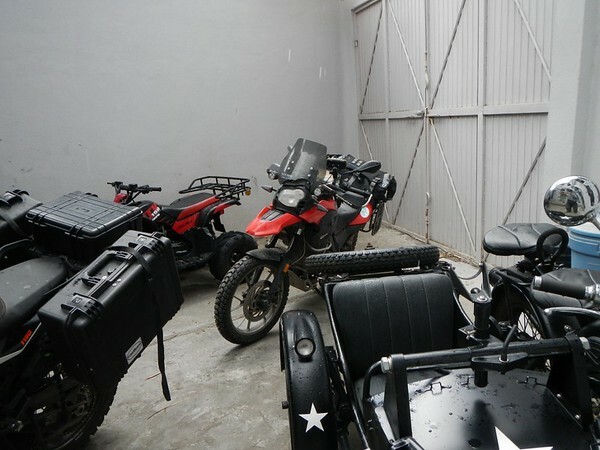 We rode back to San Miguel in a complete downpour, heavy rain with hail and parked the bikes securely in the Bat Cave. 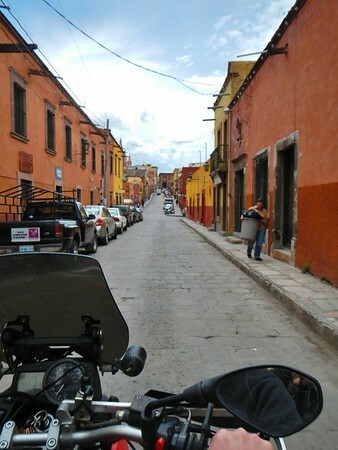 Here is a picture Deby took from the back of her bike one day when we rode two up into El Centro of San Miguel. Nice typical street scene. 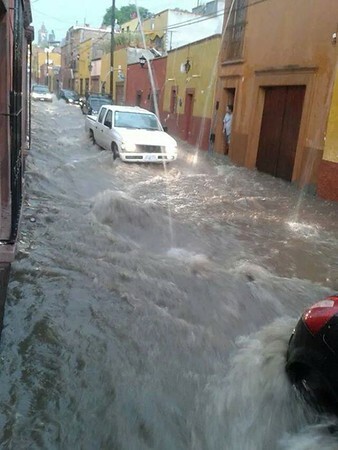 Below is a picture from Facebook a friend posted (thanks Kim) of a nearby street with all the rain. Thursday morning it was time to say good bye to San Miguel and ride towards Santa Clara del Cobre in the state of Michoacan. Deby had been wanting to go there for years as it is the mecca for copper artisans. We decided to stay at the slightly larger town of Patzcuaro Thursday night and then ride to Santa Clara early Friday morning. Sure enough after about 80 miles the mighty KTM lost power, worse than before. Almost zero acceleration which made passing challenging, hill climbing slow and passing on a hill impossible. Riding a motorcycle in Mexico is challenging enough without lacking a grip full of power to get out of a bind. We limped into Patzcuaro and checked into Posada de Don Vasco. Friday we were excited to get an early start to Santa Clara del Cobre where we spent most of the day walking around and exploring the copper art. My bike ran ok since it was less than 80 miles and we were riding relatively slowly. 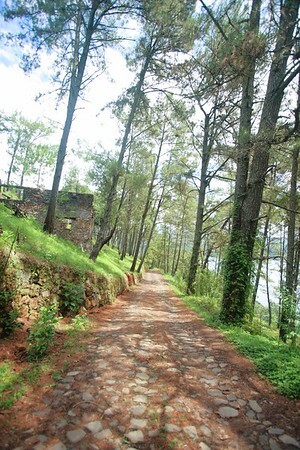 This picture is of the road from the cabana website, it doesn’t show how steep it was or how slippery it was when wet. Unfazed at the possibility that I might have to leave the KTM, and ride with Deby to Patzcuaro I went to the office to see about renting a cabana for a few days. She spoke zero English and so in my limited but improving Spanish I determined they were full for the upcoming weekend. Dejected, I walked back to my bike in the rain and amazingly it started. That was a good sign but there was almost no power to make it up the slippery road. Clutch slipping and good karma eventually got us to the top and the 10 mile cobblestone ride back to the main road. By this time the rain was coming down steadily so we opted for the libre, (not toll road) back to Patz. It would have been a wonderful ride on a dry day but in the increasing downpour the smooth very twisty blacktop through the mountains was challenging to negotiate. Before dark on Friday, in what had become a deluge we parked the bikes at the hotel. Little did we know they wouldn’t move for days as the storm seem to sit over us like a black cloud following someone in a children’s cartoon. Having plenty of time on our hands I made this little video about our stay in Patzcauro so far. 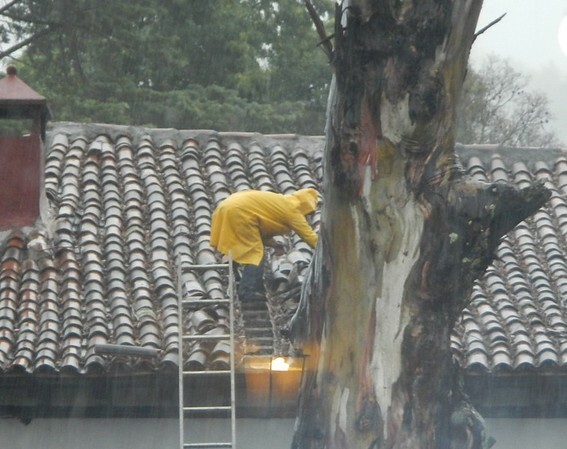 I took this picture of one of the hotel staff doing a little roof repair in the rain. It’s Sunday afternoon and still raining, we’re getting antsy to leave so we may ride in the rain tomorrow, perhaps back to San Miguel. With the continued problems with the KTM I called the dealer again and asked about getting a fuel filter. They recommended I call a US dealer and try to get one shipped to us. I called my friends at I-90 Motorsports in Issaquah and Brent recommend AZmotocity in Arizona. I talked to Mark and he was very helpful, we made arrangements to get a filter sent to my friend Fabian Tostado at Motopremium KTM. I’m told it should be there on Tuesday…. we’ll see. So as usual, an adventure is never what you might expect. It could be worse, we are at a relatively nice hotel, we are getting to be friends with all the staff, we are having forced down time to read, relax, plan and wait for the rain to dissipate. I hope you like this post and the videos. Sorry to hear about the rain and KTM issues but the good news is your blog website is worth $458.95. That should help get you a box of filters. Hopefully the weather will turn and your adventure can continue. The copper art was amazing! Hmmmm. Not sure that sounds like fun. But, it will be great story telling after a bit of time passes. Not so bad. I loved the trip to the copper town . What beautiful vases and other pieces. Loved the pumpkin. Deb must have been going nuts! Didn’t put in a “password” last time and I don’t know if you saw my comment on the Casa Gaudi. What a gem. DUDE! Bummer about the bike. Wondering: coil problem? Runs on and off, maybe you are running on one jug when the coil acts up? I had a two cylinder boat do this years ago with a bad coil; runs great, then hardly runs, no spark to cylinder #2. Just a thought, good luck, totally jealous of your current adventure. Guessing you will be leaving Deb in copper pounder town?